Yesterday I was informed in an email from Springer that some of those results about area quantization have found their way into a newly-published graduate textbook. Although this is not the first time that somebody writes about what I have done (see footnotes) but this time feels differently because my physics is now a part of a graduate course book. Here is the book: "Quantum Field Theory II: Introductions to Quantum Gravity, Supersymmetry and String Theory (Graduate Texts in Physics.) written by E.B. Manoukian and published by Springer on September 2016). I read some parts of it, yet not all, and to my point of view it is quite decent book in the field, well-written and organized, and clear. 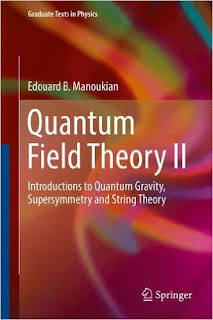 It provides interesting insights about recent developments in quantum field theory. More importantly it teaches how modern physicists think about quantum foundations, overall a must-read book for graduate students working on quantum field theory. 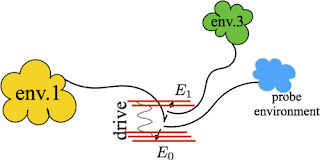 This is pretty exciting to see that the degeneracy of quantum area spectrum and its physical applications ten years after its discovery are now exercises for young students! * D. Oriti, Approaches to Quantum Gravity: Toward a New Understanding of Space, Time and Matter (Cambridge University Press 2009) highlighted my research on black hole and area quantization. * M. Aschwanden, Self-Organized Criticality in Astrophysics: The Statistics of Nonlinear Processes in the Universe (Springer London 2011) highlighted my research on cellular automata, self-organized criticality and nonequilibrium phenomena. * A section 2.46.3 of the book: The Cosmic Compendium: Black Holes by R. W. Anderson has devoted only to explain my results on black hole. * The article by L. Smolin, in Physics Today 59 Nov 44 (2006) highlighted some of my results on black holes http://dx.doi.org/10.1063/1.2435646 , etc.